For TeleMetrum, TeleMega and EasyMega, the battery can be charged by plugging it into the corresponding socket of the device and then using the USB cable to plug the flight computer into your computer’s USB socket. The on-board circuitry will charge the battery whenever it is plugged in, because the on-off switch does NOT control the charging circuitry. The Lithium Polymer TeleMini and EasyMini battery can be charged by disconnecting it from the board and plugging it into a standalone battery charger such as LipoCharger, and connecting that via a USB cable to a laptop or other USB power source. On TeleMetrum v1 boards, when the GPS chip is initially searching for satellites, TeleMetrum will consume more current than it pulls from the USB port, so the battery must be attached in order to get satellite lock. Once GPS is locked, the current consumption goes back down enough to enable charging while running. So it’s a good idea to fully charge the battery as your first item of business so there is no issue getting and maintaining satellite lock. The yellow charge indicator led will go out when the battery is nearly full and the charger goes to trickle charge. It can take several hours to fully recharge a deeply discharged battery. TeleMetrum v2.0, TeleMega and EasyMega use a higher power battery charger, allowing them to charge the battery while running the board at maximum power. When the battery is charging, or when the board is consuming a lot of power, the red LED will be lit. When the battery is fully charged, the green LED will be lit. When the battery is damaged or missing, both LEDs will be lit, which appears yellow. There are two ground stations available, the TeleDongle USB to RF interface and the TeleBT Bluetooth/USB to RF interface. If you plug either of these in to your Mac or Linux computer it should “just work”, showing up as a serial port device. Windows systems need driver information that is part of the AltOS download to know that the existing USB modem driver will work. We therefore recommend installing our software before plugging in TeleDongle if you are using a Windows computer. If you are using an older version of Linux and are having problems, try moving to a fresher kernel (2.6.33 or newer). TeleBT can also connect to an Android device over BlueTooth or USB. The AltosDroid Android application is available from the Google Play system. You don’t need a data plan to use AltosDroid, but without network access, you’ll want to download offline map data before wandering away from the network. Altus Metrum flight computers include a beeper to provide information about the state of the system. TeleMini doesn’t have room for a beeper, so instead it uses an LED, which works the same, except for every beep is replaced with the flash of the LED. Here’s a short summary of all of the modes and the beeping (or flashing, in the case of TeleMini v1) that accompanies each mode. In the description of the beeping pattern, “dit” means a short beep while "dah" means a long beep (three times as long). “Brap” means a long dissonant tone. Ready to accept commands over USB or radio link. Continuity indication for the four additional pyro channels on TeleMega and EasyMega. One high tone for no continuity, one low tone for continuity. These are produced after the continuity indicators for the two primary igniter channels. For devices with a radio transmitter, in addition to the digital and APRS telemetry signals, you can also receive audio tones with a standard amateur 70cm FM receiver. While on the pad, you will hear igniter status once every five seconds. During ascent, the tones will be muted to allow the telemetry data to consume the full radio bandwidth. During descent and after landing, a ½ second tone will be transmitted every five seconds. This can be used to find the rocket using RDF techniques when the signal is too weak to receive GPS information via telemetry or APRS. The flight computer is waiting to detect launch and then fly the rocket. In this mode, the USB link is disabled, and the radio goes into transmit-only mode. The only way to get out of this mode is to power the flight computer down. See below for how to get the flight computer to come up in Flight/Pad mode at power on. The flight computer is ready to communicate over USB and in packet mode over the radio. You can configure the flight computer, download data or display the current state. See below for how to get the flight computer to come up in Idle mode at power on. For flight computers with accelerometers (TeleMetrum, EasyMega and TeleMega), the mode is selected by the orientation of the board during the self test interval. If the board is pointing upwards as if ready to fly, it will enter Flight/Pad mode. Otherwise, it will enter Idle mode. For TeleMini v1.0, if a packet link is waiting to connect when the device is powered on, it will enter Idle mode, otherwise it will enter Flight/Pad mode. EasyMini and TeleMini v2 are designed to use either a lithium polymer battery or any other battery producing between 4 and 12 volts, such as a rectangular 9V battery. TeleMega, EasyMega and TeleMetrum are only designed to operate off a single-cell Lithium Polymer battery and cannot be used with any other kind. Connecting a different kind of battery to any of these will destroy the board. TeleMetrum is a 1 inch by 2¾ inch circuit board. It was designed to fit inside coupler for 29mm air-frame tubing, but using it in a tube that small in diameter may require some creativity in mounting and wiring to succeed! The presence of an accelerometer means TeleMetrum should be aligned along the flight axis of the airframe, and by default the ¼ wave UHF wire antenna should be on the nose-cone end of the board. The antenna wire is about 7 inches long, and wiring for a power switch and the e-matches for apogee and main ejection charges depart from the fin can end of the board, meaning an ideal “simple” avionics bay for TeleMetrum should have at least 10 inches of interior length. Otherwise, they’re the same size, with mounting holes and screw terminals in the same position. To connect the negative battery terminal to the TeleMetrum ground, insert a small piece of wire, 24 to 28 gauge stranded, into the GND hole just above the screw terminal strip and solder it in place. Connecting the positive battery terminal to the pyro charges must be done separate from TeleMetrum, by soldering them together or using some other connector. The other lead from each pyro charge is then inserted into the appropriate per-pyro channel screw terminal (terminal 4 for the Main charge, terminal 6 for the Apogee charge). As explained above, an external active switch requires three connections, one to the positive battery terminal, one to the flight computer positive input and one to ground. The positive battery terminal is available on screw terminal 2, the positive flight computer input is on terminal 1. To hook a lead to ground, solder a piece of wire, 24 to 28 gauge stranded, to the GND hole just above terminal 1. TeleMini v3 is 0.5 inches by 1.67 inches. It was designed to fit inside an 18mm air-frame tube, but using it in a tube that small in diameter may require some creativity in mounting and wiring to succeed! Since there is no accelerometer, TeleMini can be mounted in any convenient orientation. The default ¼ wave UHF wire antenna attached to the center of one end of the board is about 7 inches long. Screw terminals for the power switch are located in the middle of the board. Screw terminals for the e-matches for apogee and main ejection charges depart from the other end of the board, meaning an ideal “simple” avionics bay for TeleMini should have at least 9 inches of interior length. As described above, using an external pyro battery involves connecting the negative battery terminal to the flight computer ground, connecting the positive battery terminal to one of the igniter leads and connecting the other igniter lead to the per-channel pyro circuit connection. Because there is no solid ground connection to use on TeleMini, this is not recommended. The only available ground connection on TeleMini v3 are the two mounting holes next to the telemetry antenna. Somehow connect a small piece of wire to one of those holes and hook it to the negative pyro battery terminal. Connecting the positive battery terminal to the pyro charges must be done separate from TeleMini v3, by soldering them together or using some other connector. The other lead from each pyro charge is then inserted into the appropriate per-pyro channel screw terminal (terminal 3 for the Main charge, terminal 1 for the Apogee charge). As explained above, an external active switch requires three connections, one to the positive battery terminal, one to the flight computer positive input and one to ground. Again, because TeleMini doesn’t have any good ground connection, this is not recommended. The positive battery terminal is available on the Right power switch wire, the positive flight computer input is on the left power switch wire. Hook a lead to either of the mounting holes for a ground connection. After TeleMini powers up, it will check to see if some device is attempting to communicate with it using Packet Link Mode. If so, it will switch to idle mode and start communicating. To switch to flight mode, reboot the device either over the radio link or by powering it off and back on. If no ground station is attempting to communicate using Packet Link Mode, TeleMini will enter pad mode and prepare for flight. Configure the ground station data rate, frequency and callsign to match the TeleMini settings. 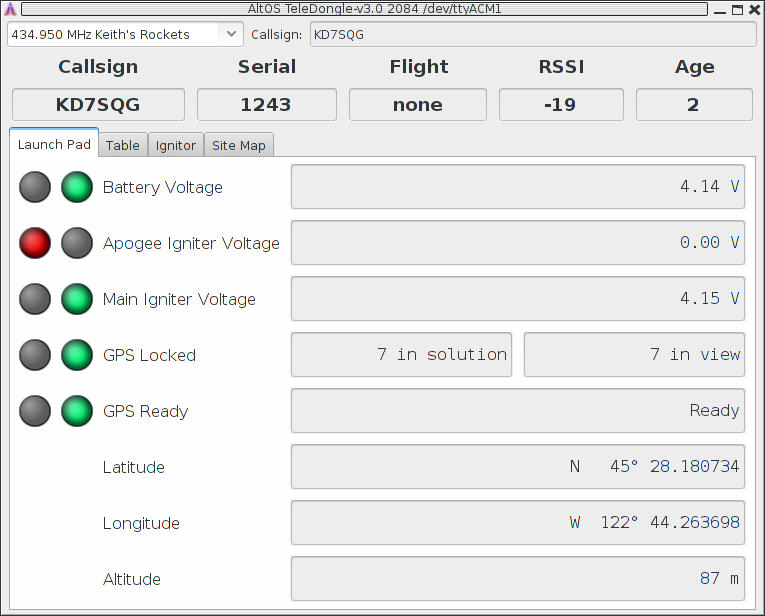 Start Packet Link Mode in the ground station by selecting the desired operation (Safe Flight Data, Configure Altimeter, Fire Igniter or Monitor Idle). Select the TeleBT or TeleDongle device. The red LED should begin flashing rapidly. Turn on TeleMini. You should see the red LED flash very rapidly during the initial communication burst, but it should then slow down when the link is idle. Once TeleMini is in Idle mode, it will stay in that mode until rebooted. That means you can stop one Packet Link operation, wait a while and start another Packet Link operation. If you don’t know what the TeleMini frequency and callsign settings are, you can temporarily force it back to the original default values (frequency 434.550MHz, callsign N0CALL) by connecting a wire between hole 3 and hole 7 on the debug connector. Hole 3 has the square pad around it, hole 7 is the one nearest the MS5607 baro sensor, which is a rectangular component with a metal cap that has two holes in it. Once TeleMini has been powered up with this wire connected, the wire may be removed. The radio parameters will stay set to these default values until changed by the user or when the device is rebooted. TeleMini v1 is the earlier version of this product. It has a lower-power radio, less storage, no beeper and soldered-in wires instead of screw terminals for the power switch. TeleMega is a 1¼ inch by 3¼ inch circuit board. It was designed to easily fit in a 38mm coupler. Like TeleMetrum, TeleMega has an accelerometer and so it must be mounted so that the board is aligned with the flight axis. It can be mounted either antenna up or down. Serial port connector replaced with servo connector with support for up to 4 PWM channels. Radio switched from cc1120 to cc1200. None of these affect operation using the stock firmware, but they do mean that the device needs different firmware to operate correctly, so make sure you load the right firmware when reflashing the device. TeleMega provides explicit support for an external pyro battery. All that is required is to remove the jumper between the lipo terminal (Bottom 3) and the pyro terminal (Bottom 2). Then hook the negative pyro battery terminal to ground (Bottom 1) and the positive pyro battery to the pyro battery input (Bottom 2). You can then use the existing pyro screw terminals to hook up all of the pyro charges. Because TeleMega has built-in support for a separate pyro battery, if you want to fly with just one battery running both the computer and firing the charges, you need to connect the flight computer battery to the pyro circuit. TeleMega has two screw terminals for this—hook a wire from the Lipo terminal (Bottom 3) to the Pyro terminal (Bottom 2). The positive battery terminal is available on Top terminal 1, the positive flight computer input is on Top terminal 2. Ground is on Top terminal 3. EasyMega is a 1¼ inch by 2¼ inch circuit board. It was designed to easily fit in a 38mm coupler. Like TeleMetrum, EasyMega has an accelerometer and so it must be mounted so that the board is aligned with the flight axis. It can be mounted either antenna up or down. EasyMega provides explicit support for an external pyro battery. All that is required is to remove the jumper between the lipo terminal (Bottom 3) and the pyro terminal (Bottom 2). Then hook the negative pyro battery terminal to ground (Bottom 1) and the positive pyro battery to the pyro battery input (Bottom 2). You can then use the existing pyro screw terminals to hook up all of the pyro charges. Because EasyMega has built-in support for a separate pyro battery, if you want to fly with just one battery running both the computer and firing the charges, you need to connect the flight computer battery to the pyro circuit. EasyMega has two screw terminals for this—hook a wire from the Lipo terminal (Bottom 3) to the Pyro terminal (Bottom 2). Ejection charges are wired directly to the screw terminal block at the aft end of the altimeter. You’ll need a very small straight blade screwdriver for these screws, such as you might find in a jeweler’s screwdriver set. Except for TeleMini v1.0, the flight computers also use the screw terminal block for the power switch leads. On TeleMini v1.0, the power switch leads are soldered directly to the board and can be connected directly to a switch. For most air-frames, the integrated antennas are more than adequate. However, if you are installing in a carbon-fiber or metal electronics bay which is opaque to RF signals, you may need to use off-board external antennas instead. In this case, you can replace the stock UHF antenna wire with an edge-launched SMA connector, and, on TeleMetrum v1, you can unplug the integrated GPS antenna and select an appropriate off-board GPS antenna with cable terminating in a U.FL connector. In the US, you need an amateur radio license or other authorization to legally operate the radio transmitters that are part of our products. In the rocket itself, you just need a flight computer and a single-cell, 3.7 volt nominal Li-Po rechargeable battery. An 850mAh battery weighs less than a 9V alkaline battery, and will run a TeleMetrum, TeleMega or EasyMega for hours. A 110mAh battery weighs less than a triple A battery and is a good choice for use with TeleMini or EasyMini. By default, we ship TeleMini, TeleMetrum and TeleMega flight computers with a simple wire antenna. If your electronics bay or the air-frame it resides within is made of carbon fiber, which is opaque to RF signals, you may prefer to install an SMA connector so that you can run a coaxial cable to an antenna mounted elsewhere in the rocket. However, note that the GPS antenna is fixed on all current products, so you really want to install the flight computer in a bay made of RF-transparent materials if at all possible. To receive the data stream from the rocket, you need an antenna and short feed-line connected to one of our TeleDongle units. If possible, use an SMA to BNC adapter instead of feedline between the antenna feedpoint and TeleDongle, as this will give you the best performance. The TeleDongle in turn plugs directly into the USB port on a notebook computer. Because TeleDongle looks like a simple serial port, your computer does not require special device drivers…​ just plug it in. Alternatively, a TeleBT attached with an SMA to BNC adapter at the feed point of a hand-held yagi used in conjunction with an Android device running AltosDroid makes an outstanding ground station. After the flight, you can use the radio link to extract the more detailed data logged in either TeleMetrum or TeleMini devices, or you can use a USB cable to plug into the flight computer board directly. A USB cable is also how you charge the Li-Po battery, so you’ll want one of those anyway. The same cable used by lots of digital cameras and other modern electronic stuff will work fine. If your rocket lands out of sight, you may enjoy having a hand-held GPS receiver, so that you can put in a way-point for the last reported rocket position before touch-down. This makes looking for your rocket a lot like Geo-Caching…​ just go to the way-point and look around starting from there. AltosDroid on an Android device with GPS receiver works great for this, too! You may also enjoy having a ham radio “HT” that covers the 70cm band…​ you can use that with your antenna to direction-find the rocket on the ground the same way you can use a Walston or Beeline tracker. This can be handy if the rocket is hiding in sage brush or a tree, or if the last GPS position doesn’t get you close enough because the rocket dropped into a canyon, or the wind is blowing it across a dry lake bed, or something like that…​ Keith currently uses a Yaesu FT1D, Bdale has a Yaesu VX-7R, which is a nicer radio in most ways but doesn’t support APRS. The best hand-held commercial directional antennas we’ve found for radio direction finding rockets are from Arrow Antennas. The 440-3 and 440-5 are both good choices for finding a TeleMetrum- or TeleMini- equipped rocket when used with a suitable 70cm HT. TeleDongle and an SMA to BNC adapter fit perfectly between the driven element and reflector of Arrow antennas. 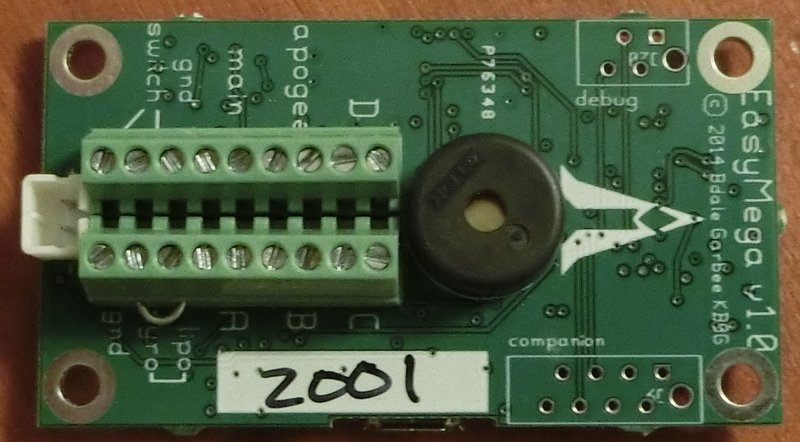 We have designed and prototyped several “companion boards” that can attach to the companion connector on TeleMetrum, TeleMega and EasyMega flight computers to collect more data, provide more pyro channels, and so forth. We do not yet know if or when any of these boards will be produced in enough quantity to sell. If you have specific interests for data collection or control of events in your rockets beyond the capabilities of our existing productions, please let us know! Selecting this item brings up a dialog box listing all of the connected TeleDongle devices. When you choose one of these, AltosUI will create a window to display telemetry data as received by the selected TeleDongle device. All telemetry data received are automatically recorded in suitable log files. The name of the files includes the current date and rocket serial and flight numbers. The radio frequency being monitored by the TeleDongle device is displayed at the top of the window. You can configure the frequency by clicking on the frequency box and selecting the desired frequency. AltosUI remembers the last frequency selected for each TeleDongle and selects that automatically the next time you use that device. The flight number. Each altimeter remembers how many times it has flown. The rocket flight state. Each flight passes through several states including Pad, Boost, Fast, Coast, Drogue, Main and Landed. The Received Signal Strength Indicator value. This lets you know how strong a signal TeleDongle is receiving. At the default data rate, 38400 bps, in bench testing, the radio inside TeleDongle v0.2 operates down to about -106dBm, while the v3 radio works down to about -111dBm. Weaker signals, or an environment with radio noise may cause the data to not be received. The packet link uses error detection and correction techniques which prevent incorrect data from being reported. The age of the displayed data, in seconds since the last successfully received telemetry packet. In normal operation this will stay in the low single digits. If the number starts counting up, then you are no longer receiving data over the radio link from the flight computer. Finally, the largest portion of the window contains a set of tabs, each of which contain some information about the rocket. They’re arranged in 'flight order' so that as the flight progresses, the selected tab automatically switches to display data relevant to the current state of the flight. You can select other tabs at any time. The final 'table' tab displays all of the raw telemetry values in one place in a spreadsheet-like format. This indicates whether the Li-Po battery powering the flight computer has sufficient charge to last for the duration of the flight. A value of more than 3.8V is required for a 'GO' status. This indicates whether the apogee igniter has continuity. If the igniter has a low resistance, then the voltage measured here will be close to the Li-Po battery voltage. A value greater than 3.2V is required for a 'GO' status. This indicates whether the main igniter has continuity. If the igniter has a low resistance, then the voltage measured here will be close to the Li-Po battery voltage. A value greater than 3.2V is required for a 'GO' status. This indicates whether there is space remaining on-board to store flight data for the upcoming flight. If you’ve downloaded data, but failed to erase flights, there may not be any space left. Most of our flight computers can store multiple flights, depending on the configured maximum flight log size. TeleMini v1.0 stores only a single flight, so it will need to be downloaded and erased after each flight to capture data. This only affects on-board flight logging; the altimeter will still transmit telemetry and fire ejection charges at the proper times even if the flight data storage is full. For a TeleMetrum or TeleMega device, this indicates whether the GPS receiver is currently able to compute position information. GPS requires at least 4 satellites to compute an accurate position. For a TeleMetrum or TeleMega device, this indicates whether GPS has reported at least 10 consecutive positions without losing lock. This ensures that the GPS receiver has reliable reception from the satellites. The Launchpad tab also shows the computed launch pad position and altitude, averaging many reported positions to improve the accuracy of the fix. This tab is shown during Boost, Fast and Coast phases. The information displayed here helps monitor the rocket as it heads towards apogee. The height, speed, acceleration and tilt are shown along with the maximum values for each of them. This allows you to quickly answer the most commonly asked questions you’ll hear during flight. The current latitude and longitude reported by the GPS are also shown. Note that under high acceleration, these values may not get updated as the GPS receiver loses position fix. Once the rocket starts coasting, the receiver should start reporting position again. 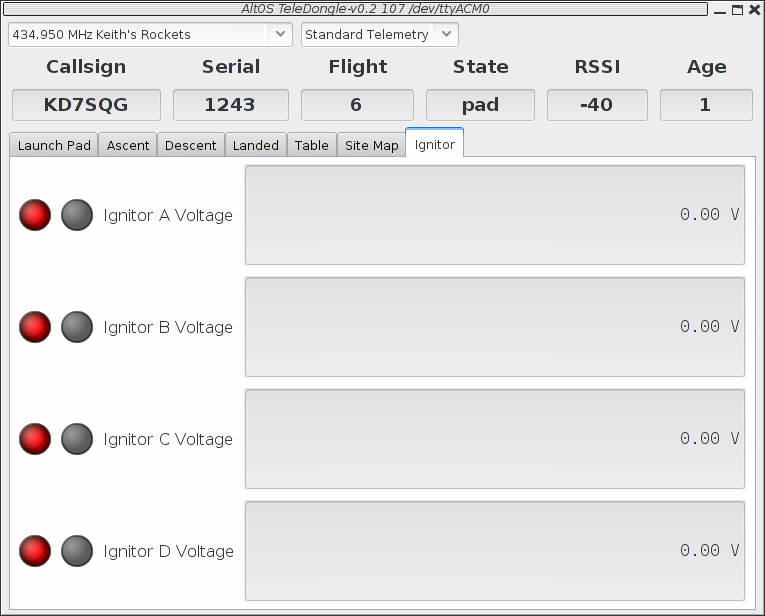 Finally, the current igniter voltages are reported as in the Launch Pad tab. This can help diagnose deployment failures caused by wiring which comes loose under high acceleration. Once the rocket has reached apogee and (we hope) activated the apogee charge, attention switches to tracking the rocket on the way back to the ground, and for dual-deploy flights, waiting for the main charge to fire. To monitor whether the apogee charge operated correctly, the current descent rate is reported along with the current height. Good descent rates vary based on the choice of recovery components, but generally range from 15-30m/s on drogue and should be below 10m/s when under the main parachute in a dual-deploy flight. With GPS-equipped flight computers, you can locate the rocket in the sky using the elevation and bearing information to figure out where to look. Elevation is in degrees above the horizon. Bearing is reported in degrees relative to true north. Range can help figure out how big the rocket will appear. Ground Distance shows how far it is to a point directly under the rocket and can help figure out where the rocket is likely to land. Note that all of these values are relative to the pad location. If the elevation is near 90°, the rocket is over the pad, not over you. Finally, the igniter voltages are reported in this tab as well, both to monitor the main charge as well as to see what the status of the apogee charge is. Note that some commercial e-matches are designed to retain continuity even after being fired, and will continue to show as green or return from red to green after firing. Once the rocket is on the ground, attention switches to recovery. While the radio signal is often lost once the rocket is on the ground, the last reported GPS position is generally within a short distance of the actual landing location. The last reported GPS position is reported both by latitude and longitude as well as a bearing and distance from the launch pad. The distance should give you a good idea of whether to walk or hitch a ride. Take the reported latitude and longitude and enter them into your hand-held GPS unit and have that compute a track to the landing location. Our flight computers will continue to transmit RDF tones after landing, allowing you to locate the rocket by following the radio signal if necessary. You may need to get away from the clutter of the flight line, or even get up on a hill (or your neighbor’s RV roof) to receive the RDF signal. The maximum height, speed and acceleration reported during the flight are displayed for your admiring observers. The accuracy of these immediate values depends on the quality of your radio link and how many packets were received. Recovering the on-board data after flight may yield more precise results. To get more detailed information about the flight, you can click on the 'Graph Flight' button which will bring up a graph window for the current flight. 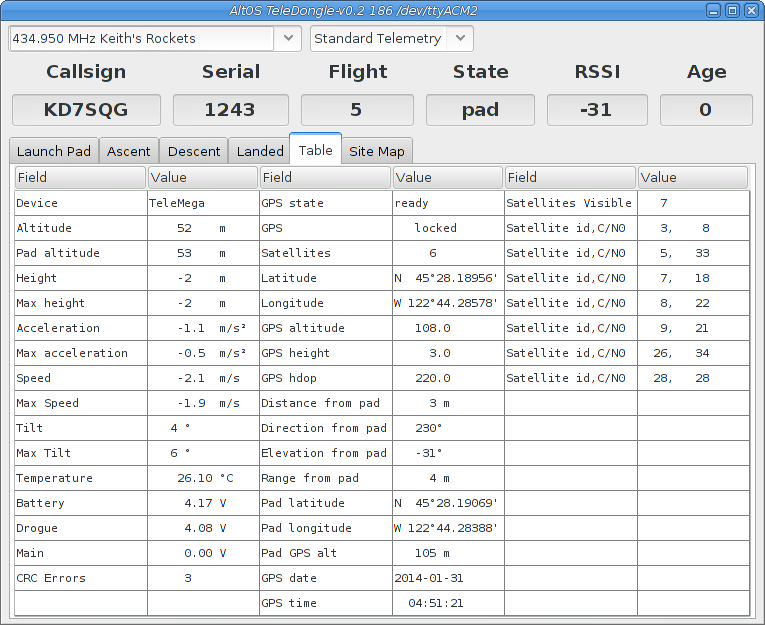 The table view shows all of the data available from the flight computer. Probably the most useful data on this tab is the detailed GPS information, which includes horizontal dilution of precision information, and information about the signal being received from the satellites. When the TeleMetrum has a GPS fix, the Site Map tab will map the rocket’s position to make it easier for you to locate the rocket, both while it is in the air, and when it has landed. The rocket’s state is indicated by color: white for pad, red for boost, pink for fast, yellow for coast, light blue for drogue, dark blue for main, and black for landed. The map’s default scale is approximately 3m (10ft) per pixel. The map can be dragged using the left mouse button. The map will attempt to keep the rocket roughly centered while data is being received. You can adjust the style of map and the zoom level with buttons on the right side of the map window. You can draw a line on the map by moving the mouse over the map with a button other than the left one pressed, or by pressing the left button while also holding down the shift key. The length of the line in real-world units will be shown at the start of the line. Images are fetched automatically via the Google Maps Static API, and cached on disk for reuse. If map images cannot be downloaded, the rocket’s path will be traced on a dark gray background instead. You can pre-load images for your favorite launch sites before you leave home; check out Load Maps. TeleMega includes four additional programmable pyro channels. The Ignitor tab shows whether each of them has continuity. If an ignitor has a low resistance, then the voltage measured here will be close to the pyro battery voltage. A value greater than 3.2V is required for a 'GO' status. The altimeter records flight data to its internal flash memory. Data logged on board is recorded at a much higher rate than the telemetry system can handle, and is not subject to radio drop-outs. As such, it provides a more complete and precise record of the flight. The 'Save Flight Data' button allows you to read the flash memory and write it to disk. Clicking on the 'Save Flight Data' button brings up a list of connected flight computers and TeleDongle devices. If you select a flight computer, the flight data will be downloaded from that device directly. If you select a TeleDongle device, flight data will be downloaded from a flight computer over radio link via the specified TeleDongle. See Controlling An Altimeter Over The Radio Link for more information. Once a flight record is selected, the flight monitor interface is displayed and the flight is re-enacted in real time. Check Monitor Flight to learn how this window operates. Shows a satellite image of the flight area overlaid with the path of the flight. The red concentric circles mark the launch pad, the black concentric circles mark the landing location. This tool takes the raw data files and makes them available for external analysis. When you select this button, you are prompted to select a flight data file, which can be either a .eeprom or .telem. The .eeprom files contain higher resolution and more continuous data, while .telem files contain receiver signal strength information. Next, a second dialog appears which is used to select where to write the resulting file. It has a selector to choose between CSV and KML file formats. This is the format used by Google Earth to provide an overlay within that application. With this, you can use Google Earth to see the whole flight path in 3D. Select this button and then select either an altimeter or TeleDongle Device from the list provided. Selecting a TeleDongle device will use the radio link to configure a remote altimeter. This configures which of the frequencies to use for both telemetry and packet command mode. Note that if you set this value via packet command mode, the TeleDongle frequency will also be automatically reconfigured to match so that communication will continue afterwards. The radios in every Altus Metrum device are calibrated at the factory to ensure that they transmit and receive on the specified frequency. If you need to you can adjust the calibration by changing this value. Do not do this without understanding what the value means, read the appendix on calibration and/or the source code for more information. To change a TeleDongle’s calibration, you must reprogram the unit completely. Enables the radio for transmission during flight. When disabled, the radio will not transmit anything during flight at all. This sets the modulation bit rate for data transmission for both telemetry and packet link mode. Lower bit rates will increase range while reducing the amount of data that can be sent and increasing battery consumption. All telemetry is done using a rate 1/2 constraint 4 convolution code, so the actual data transmission rate is 1/2 of the modulation bit rate specified here. How often to transmit GPS information via APRS (in seconds). When set to zero, APRS transmission is disabled. This option is available on TeleMetrum v2 and TeleMega boards. TeleMetrum v1 boards cannot transmit APRS packets. Note that a single APRS packet takes nearly a full second to transmit, so enabling this option will prevent sending any other telemetry during that time. Which SSID to report in APRS packets. By default, this is set to the last digit of the serial number, but can be configured to any value from 0 to 9. Whether to send APRS data in Compressed or Uncompressed format. Compressed format is smaller and more precise. Uncompressed format is older, but may work better with your device. The Kenwood TH-D72 only displays altitude information with Uncompressed format, while the Yaesu FT1D only displays altitude with Compressed format. Test before you fly to see which to use. This sets the call sign included in each telemetry packet. Set this as needed to conform to your local radio regulations. Because they include accelerometers, TeleMetrum, TeleMega and EasyMega are sensitive to the orientation of the board. By default, they expect the antenna end to point forward. This parameter allows that default to be changed, permitting the board to be mounted with the antenna pointing aft instead. In this mode, the antenna end of the flight computer must point forward, in line with the expected flight path. In this mode, the antenna end of the flight computer must point aft, in line with the expected flight path. This sets the amount of motion that TeleGPS needs to see before logging the new position. Motions smaller than this are skipped, which saves storage space. The interval between TeleGPS position reports, both over the air and in the log. Increase this to reduce the frequency of radio transmissions and the length of time available in the log. This opens a separate window to recalibrate the accelerometers. Follow the instructions, orienting the flight computer with the antenna end, or end opposite the screw terminals, in the case of EasyMega, first up and then down. When the calibration is complete, return to the Configure Altimeter window and save the new calibration values. This opens a separate window to configure the additional pyro channels available on TeleMega and EasyMega. One column is presented for each channel. Each row represents a single parameter, if enabled the parameter must meet the specified test for the pyro channel to be fired. 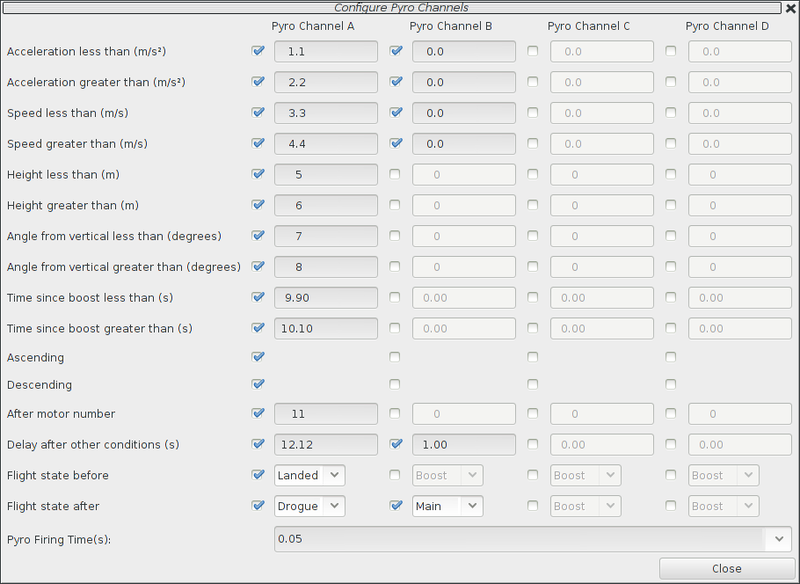 Select conditions and set the related value; the pyro channel will be activated when all of the conditions are met. Each pyro channel has a separate set of configuration values, so you can use different values for the same condition with different channels. At the bottom of the window, the 'Pyro Firing Time' configuration sets the length of time (in seconds) which each of these pyro channels will fire for. Once you have selected the appropriate configuration for all of the necessary pyro channels, you can save the pyro configuration along with the rest of the flight computer configuration by pressing the 'Save' button in the main Configure Flight Computer window. Select a value, and then choose whether acceleration away from the ground should be above or below that value. Acceleration is positive upwards, so accelerating towards the ground would produce negative numbers. Acceleration during descent is noisy and inaccurate, so be careful when using it during these phases of the flight. Select a value, and then choose whether ascent rate should be above or below that value. Ascent rate is positive upwards, so moving towards the ground would produce negative numbers. Ascent rate during descent is a bit noisy and so be careful when using it during these phases of the flight. Select a value, and then choose whether the height above the launch pad should be above or below that value. TeleMega and EasyMega contain a 3-axis gyroscope and accelerometer which is used to compute the orientation of the rocket. A record of orientations over the last 0.64 seconds is kept and the largest value within this period is compared with the specified value. Note that the tilt angle is not the change in angle from the launch pad, but rather absolute relative to gravity—the 3-axis accelerometer is used to compute the angle of the rocket on the launch pad and initialize the system. Because this value is computed by integrating rate gyros, it gets progressively less accurate as the flight goes on. It should have an accumulated error of less than 0.2°/second (after 10 seconds of flight, the error should be less than 2°). The usual use of the orientation configuration is to ensure that the rocket is traveling mostly upwards when deciding whether to ignite air starts or additional stages. For that, choose a reasonable maximum angle (like 20°) and set the motor igniter to require an angle of less than that value. Time since launch. Select a value and choose whether to activate the pyro channel before or after that amount of time. A deprecated configuration value which was the same as setting Ascent rate > 0. Existing configurations using this will be cleared and must be reconfigured by the user. A deprecated configuration value which was the same as setting Ascent rate < 0. Existing configurations using this will be cleared and must be reconfigured by the user. The flight software counts each time the rocket starts accelerating and then decelerating (presumably due to a motor or motors burning). Use this value for multi-staged or multi-airstart launches. As of version 1.8.6 firmware, this checks to make sure at least this many motors have burned. Before version 1.8.6, this checked to make sure that exactly this many motors had burned. Once the other parameters all become true, a timer is started for the specified amount of time. While the timer is running, the other parameters are checked repeatedly and if any of them become false, then the pyro channel is disabled and will not fire. If the timer expires and all of the other parameters have remained true for the entire time, then the pyro channel is fired. Boost. The motor has lit and the rocket is accelerating upwards. Ascent rate will be greater than zero. Vertical acceleration will be greater than zero. Fast. The motor has burned out and the rocket is decelerating, but it is going faster than 200m/s. Ascent rate will be greater than zero. Vertical acceleration will be less than zero. Coast. The rocket is still moving upwards and decelerating, but the Ascent rate is less than 200m/s. Ascent rate will greater than zero. Vertical acceleration will be less than zero. Drogue. The rocket has reached apogee and is heading back down, but is above the configured Main altitude. Ascent rate will be less than zero during this state. Vertical acceleration will be negative until the rocket reaches a terminal descent rate, at which point Vertical acceleration will be zero. Both Ascent rate and Vertical acceleration are very noisy in this state, so be careful when trying to use them to control pyro channels. Main. The rocket is still descending, and is below the Main altitude. Ascent rate will be less than zero during this state. Vertical acceleration may be briefly less than zero as the rocket slows from drogue descent to main descent, but it will settle down to a zero value once the rocket has reached the terminal velocity under the main chute. Ascent rate and Vertical acceleration should be much less noisy once the main chute has deployed. Landed. The rocket is no longer moving. You can select a state to limit when the pyro channel may activate; note that the check is based on when the rocket transitions into the state, and so checking for “greater than Boost” means that the rocket is currently in boost or some later state. When a motor burns out, the rocket enters either Fast or Coast state (depending on how fast it is moving). If the computer detects upwards acceleration again, it will move back to Boost state. AltosUI provides voice announcements during flight so that you can keep your eyes on the sky and still get information about the current flight status. However, sometimes you don’t want to hear them. This value is transmitted in each command packet sent from TeleDongle and received from an altimeter. It is not used in telemetry mode, as the callsign configured in the altimeter board is included in all telemetry packets. Configure this with the AltosUI operators call sign as needed to comply with your local radio regulations. Note that to successfully command a flight computer over the radio (to configure the altimeter, monitor idle, or fire pyro charges), the callsign configured here must exactly match the callsign configured in the flight computer. This matching is case sensitive. Sets the number of map 'tiles' kept in memory while the application is running. More tiles consume more memory, but will make panning around the map faster. This brings up a dialog where you can configure the set of frequencies shown in the various frequency menus. You can add as many as you like, or even reconfigure the default set. Changing this list does not affect the frequency settings of any devices, it only changes the set of frequencies shown in the menus. Select this button and then select a TeleDongle or TeleBT Device from the list provided. Note that TeleDongle and TeleBT don’t save any configuration data, the settings here are recorded on the local machine in the Java preferences database. Moving the device to another machine, or using a different user account on the same machine will cause settings made here to have no effect. This writes any changes to the local Java preferences file. If you don’t press this button, any changes you make will be lost. This configures the frequency to use for both telemetry and packet command mode. Set this before starting any operation involving packet command mode so that it will use the right frequency. Telemetry monitoring mode also provides a menu to change the frequency, and that menu also sets the same Java preference value used here. The radios in every Altus Metrum device are calibrated at the factory to ensure that they transmit and receive on the specified frequency. To change a TeleDongle or TeleBT’s calibration, you must reprogram the unit completely, so this entry simply shows the current value and doesn’t allow any changes. This lets you match the telemetry and packet link rate from the transmitter. If they don’t match, the device won’t receive any data. This reprograms Altus Metrum devices with new firmware. TeleMetrum v1.x, TeleDongle v0.2, TeleMini v1.0 and TeleBT v1.0 are all reprogrammed by using another similar unit as a programming dongle (pair programming). TeleMega, EasyMega, TeleMetrum v2, EasyMini and TeleDongle v3 are all programmed directly over USB (self programming). Please read the directions for flashing devices in Updating Device Firmware. This activates the igniter circuits in the flight computer to help test recovery systems deployment. Because this command can operate over the Packet Command Link, you can prepare the rocket as for flight and then test the recovery system without needing to snake wires inside the air-frame. This listens for telemetry packets on all of the configured frequencies, displaying information about each device it receives a packet from. You can select which of the baud rates and telemetry formats should be tried; by default, it only listens at 38400 baud with the standard telemetry format used in v1.0 and later firmware. Before heading out to a new launch site, you can use this to load satellite images in case you don’t have internet connectivity at the site. Try not to wait until the last minute, though, particularly if you’re heading to a major launch. If too many people are all trying to download map data at once, Google may limit access until the next day. A combination of satellite imagery and road data. This is the default view. Just the satellite imagery without any annotation. Roads, political boundaries and a few geographic features. Contour intervals and shading that show hills and valleys. You can specify the range of zoom levels to download; smaller numbers show more area with less resolution. The default level, 0, shows about 3m/pixel. One zoom level change doubles or halves that number. Larger zoom levels show more detail, smaller zoom levels less. The Map Radius value sets how large an area around the center point to download. Select a value large enough to cover any plausible flight from that site. Be aware that loading a large area with a high maximum zoom level can attempt to download a lot of data. Loading hybrid maps with a 10km radius at a minimum zoom of -2 and a maximum zoom of 2 consumes about 120MB of space. Terrain and road maps consume about 1/10 as much space as satellite or hybrid maps. Clicking the 'Load Map' button will fetch images from Google Maps; note that Google limits how many images you can fetch at once, so if you load more than one launch site, you may get some gray areas in the map which indicate that Google is tired of sending data to you. Try again later. This brings up a dialog similar to the Monitor Flight UI, except it works with the altimeter in “idle” mode by sending query commands to discover the current state rather than listening for telemetry packets. Because this uses command mode, it needs to have the TeleDongle and flight computer callsigns match exactly. If you can receive telemetry, but cannot manage to run Monitor Idle, then it’s very likely that your callsigns are different in some way. You can change the frequency and callsign used to communicate with the flight computer; they must both match the configuration in the flight computer exactly. 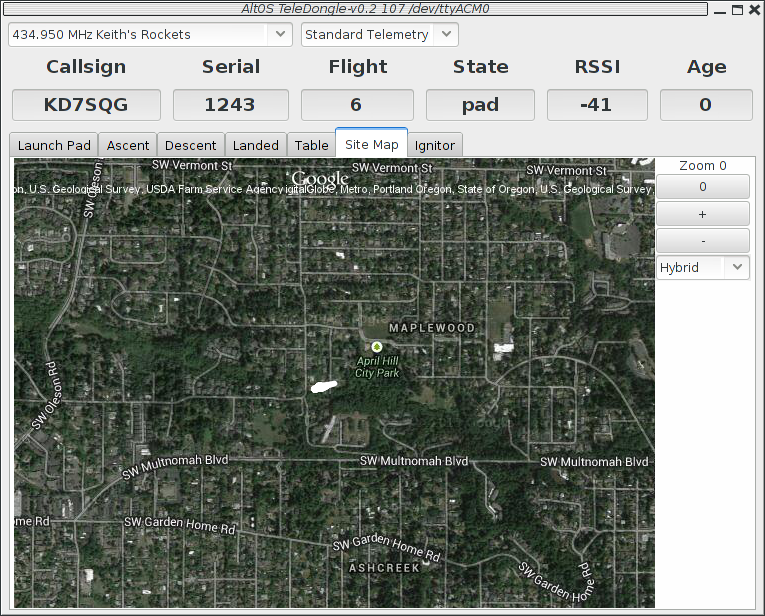 AltosDroid provides the same flight monitoring capabilities as AltosUI, but runs on Android devices. AltosDroid is designed to connect to a TeleBT receiver over Bluetooth™ and (on Android devices supporting USB On-the-go) TeleDongle and TeleBT devices over USB. AltosDroid monitors telemetry data, logging it to internal storage in the Android device, and presents that data in a UI similar to the 'Monitor Flight' window in AltosUI. This manual will explain how to configure AltosDroid, connect to TeleBT or TeleDongle, operate the flight monitoring interface and describe what the displayed data means. AltosDroid is available from the Google Play store. To install it on your Android device, open the Google Play Store application and search for “altosdroid”. Make sure you don’t have a space between “altos” and “droid” or you probably won’t find what you want. That should bring you to the right page from which you can download and install the application. Before using TeleBT with AltosDroid, make sure the internal TeleBT battery is charged. To do this, attach a micro USB cable from a computer or other USB power source to TeleBT. A dual LED on the circuit board should illuminate, showing red while the battery is charging, green when charging is completed, and both red and green on at the same time if there is a battery fault. Press the Android 'Menu' button or soft-key to see the configuration options available. Select the 'Connect a device' option and then the 'Scan for devices' entry at the bottom to look for your TeleBT device. Select your device, and when it asks for the code, enter '1234'. Subsequent connections will not require you to enter that code, and your 'paired' device will appear in the list without scanning. Get a special USB On-the-go adapter cable. These cables have a USB micro-B male connector on one end and a standard A female connector on the other end. Plug in your TeleDongle or TeleBT device to the adapter cable and the adapter cable into your phone and AltosDroid should automatically start up. If it doesn’t, the most likely reason is that your Android device doesn’t support USB On-the-go. The main AltosDroid menu has a selection of operation and configuration options. Offers a menu of available TeleBT devices, and an option to scan for additional devices. Disconnects the current TeleBT or TeleDongle device. You can reconnect TeleBT over bluetooth by using Connect a Device. You can reconnect a USB device by unplugging it and then plugging it back in. This selects which frequency to listen on by bringing up a menu of pre-set radio frequencies. Pick the one which matches your altimeter. Switches the information displays to show data for a different transmitting device. The map will always show all of the devices in view. Trackers are shown and selected by serial number, so make sure you note the serial number of devices in each airframe. Deletes all information about a transmitting device. Offers additional configuration operations. See Setup. Altus Metrum transmitters can be configured to operate at lower data rates to improve transmission range. If you have configured your device to do this, this menu item allows you to change the receiver to match. Selects which units used to report values. Displays a menu of map types and lets you select one. Hybrid maps include satellite images with a roadmap overlaid. Satellite maps dispense with the roadmap overlay. Roadmap shows just the roads. Terrain includes roads along with shadows indicating changes in elevation, and other geographical features. Select between online and offline maps. Online maps will show a 'move to current position' icon in the upper right corner, while offline maps will have copyright information all over the map. Otherwise, they’re pretty similar. Brings up a dialog allowing you to download offline map tiles so that you can have maps available even if you have no network connectivity at the launch site. This presents a dialog containing the current list of frequencies that will be show in the 'Select radio frequency' menu. You can change the label for existing frequencies, delete or add new frequencies. 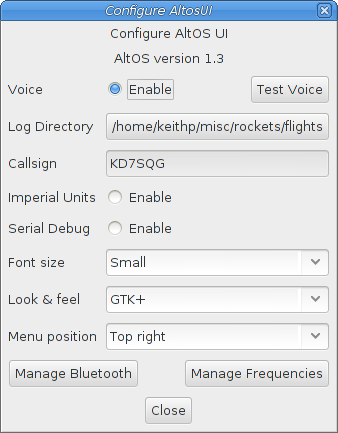 Lets you configure the callsign used by AltosDroid to communicate with the flight computer. The callsign on the two devices must match or the communication will fail. This provides a modest amount of protection against accidentally controlling another persons flight computer. This provides similar information to monitoring the telemetry stream from a flight computer in flight mode. The title of the application will change to include (idle) so you can tell this mode is active. Remotely reboots the flight computer. This is useful when the flight computers turned on while the airframe is horizontal and you want to restart the flight computers in pad mode after raising the airframe to vertical. Remotely control igniters for ground testing recovery systems. 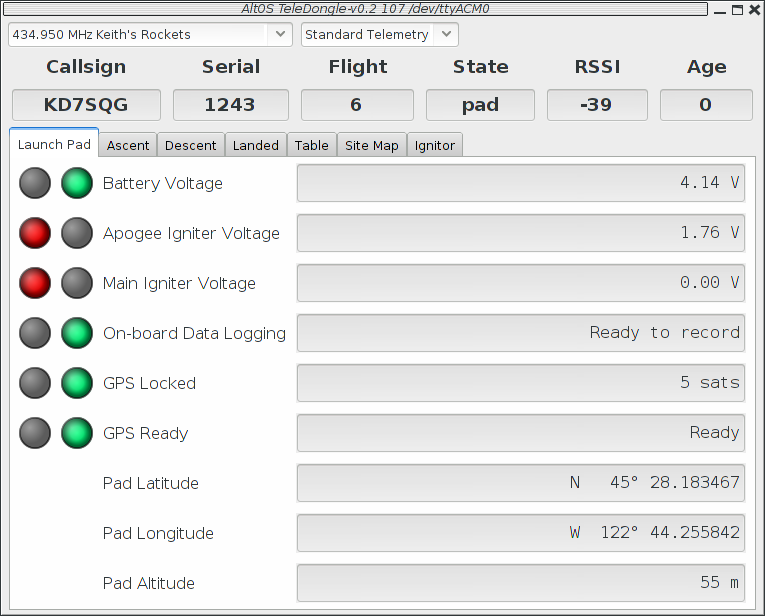 AltosDroid is designed to mimic the AltosUI flight monitoring display, providing separate tabs for each stage of your rocket flight along with a tab containing a map of the local area with icons marking the current location of the altimeter and the Android device. 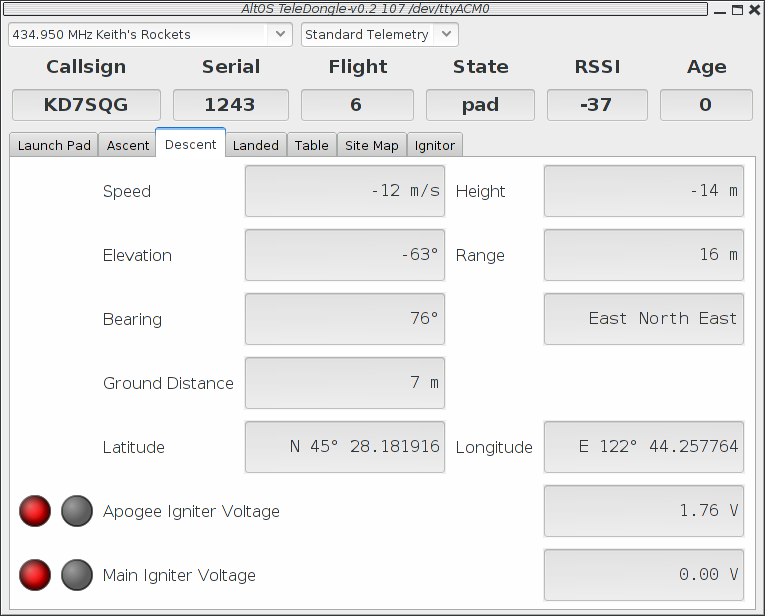 The 'Pad' tab shows information used to decide when the rocket is ready for flight. The first elements include red/green indicators, if any of these is red, you’ll want to evaluate whether the rocket is ready to launch. When the pad tab is selected, the voice responses will include status changes to the igniters and GPS reception, letting you know if the rocket is still ready for launch. This indicates whether the Li-Po battery powering the transmitter has sufficient charge to last for the duration of the flight. A value of more than 3.8V is required for a 'GO' status. This indicates whether the Li-Po battery powering the TeleBT has sufficient charge to last for the duration of the flight. A value of more than 3.8V is required for a 'GO' status. This indicates whether there is space remaining on-board to store flight data for the upcoming flight. If you’ve downloaded data, but failed to erase flights, there may not be any space left. TeleMetrum and TeleMega can store multiple flights, depending on the configured maximum flight log size. TeleGPS logs data continuously. TeleMini v1.0 stores only a single flight, so it will need to be downloaded and erased after each flight to capture data. This only affects on-board flight logging; the altimeter will still transmit telemetry and fire ejection charges at the proper times. This indicates whether the indicated additional pyro channel igniter has continuity. If the igniter has a low resistance, then the voltage measured here will be close to the Li-Po battery voltage. A value greater than 3.2V is required for a 'GO' status. The Pad tab also shows the location of the Android device. The 'Flight' tab shows information used to evaluate and spot a rocket while in flight. It displays speed and height data to monitor the health of the rocket, along with elevation, range and bearing to help locate the rocket in the sky. While the Flight tab is displayed, the voice announcements will include current speed, height, elevation and bearing information. Shows current vertical speed. During descent, the speed values are averaged over a fairly long time to try and make them steadier. Shows the current height above the launch pad. Shows the maximum vertical speed seen during the flight. Shows the maximum height above launch pad. This is the angle above the horizon from the android devices current position. The total distance from the android device to the rocket, including both ground distance and difference in altitude. Use this to gauge how large the rocket is likely to appear in the sky. This is the azimuth from true north for the rocket from the android device. Use this in combination with the Elevation value to help locate the rocket in the sky, or at least to help point the antenna in the general direction. This is provided in both degrees and a compass point (like West South West). You’ll want to know which direction is true north before launching your rocket. 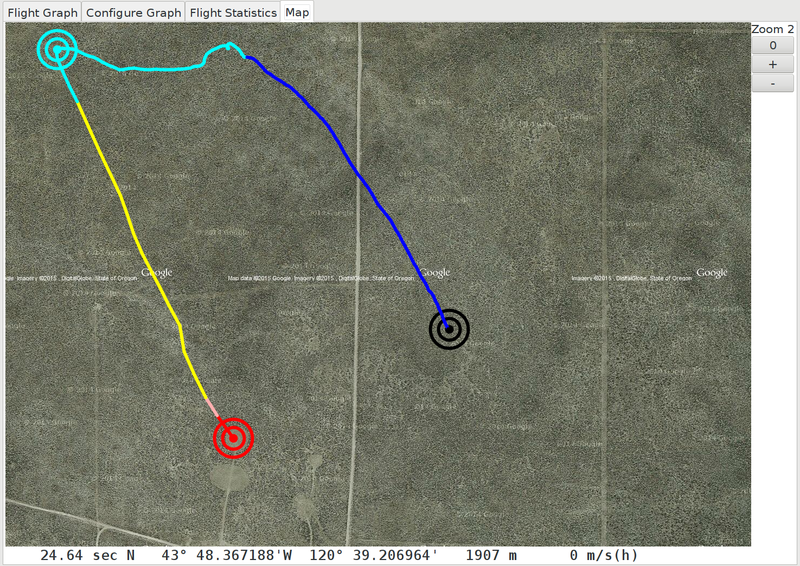 This shows the distance across the ground to the lat/lon where the rocket is located. Use this to estimate what is currently under the rocket. Displays the last known location of the rocket. The 'Recover' tab shows information used while recovering the rocket on the ground after flight. While the Recover tab is displayed, the voice announcements will include distance along with either bearing or direction, depending on whether you are moving. When you are in motion, this provides the angle from your current direction of motion towards the rocket. Distance over the ground to the rocket. Displays the location of the Android device. Shows the maximum height above launch pad seen during the flight. 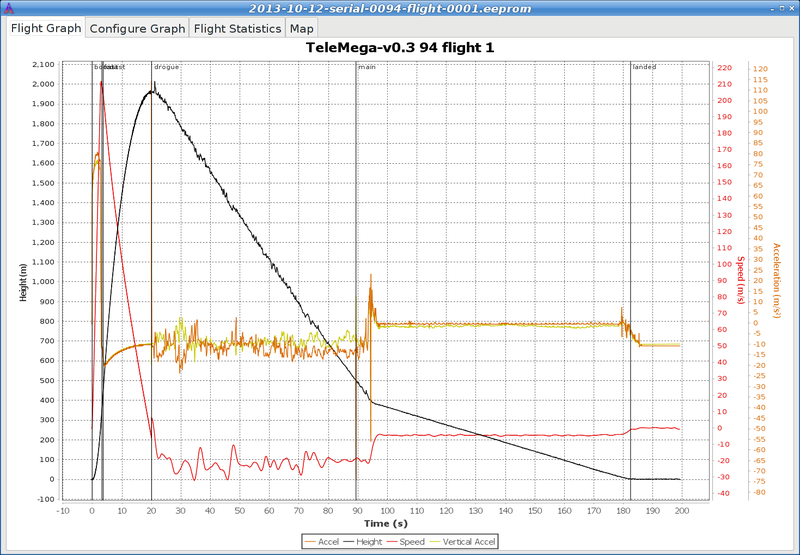 Shows the maximum vertical acceleration seen during the flight. The 'Map' tab shows a map of the area around the rocket being tracked along with information needed to recover it. On the map itself, icons showing the location of the android device along with the last known location of each tracker. A blue line is drawn from the android device location to the currently selected tracker. The Map tab provides the same voice announcements as the Recover tab. AltosDroid always saves every bit of telemetry data it receives. To download that to a computer for use with AltosUI, remove the SD card from your Android device, or connect your device to your computer’s USB port and browse the files on that device. You will find '.telem' files in the TeleMetrum directory that will work with AltosUI directly. The AltOS firmware build for the altimeters has two fundamental modes, “idle” and “flight”. Which of these modes the firmware operates in is determined at start up time. For TeleMetrum, TeleMega and EasyMega, which have accelerometers, the mode is controlled by the orientation of the rocket (well, actually the board, of course…​) at the time power is switched on. If the rocket is “nose up”, then the flight computer assumes it’s on a rail or rod being prepared for launch, so the firmware chooses flight mode. However, if the rocket is more or less horizontal, the firmware instead enters idle mode. Since EasyMini doesn’t have an accelerometer we can use to determine orientation, “idle” mode is selected if the board is connected via USB to a computer, otherwise the board enters “flight” mode. TeleMini selects “idle” mode if it receives a command packet within the first five seconds of operation. If idle mode is entered, you will hear an audible “di-dit” or see two short flashes (“I” for idle), and the flight state machine is disengaged, thus no ejection charges will fire. The altimeters also listen for the radio link when in idle mode for requests sent via TeleDongle. Commands can be issued in idle mode over either USB or the radio link equivalently. TeleMini only has the radio link. Idle mode is useful for configuring the altimeter, for extracting data from the on-board storage chip after flight, and for ground testing pyro charges. One “neat trick” of particular value when TeleMetrum, TeleMega or EasyMega are used with very large air-frames, is that you can power the board up while the rocket is horizontal, such that it comes up in idle mode. Then you can raise the air-frame to launch position, and issue a 'reset' command via TeleDongle over the radio link to cause the altimeter to reboot and come up in flight mode. This is much safer than standing on the top step of a rickety step-ladder or hanging off the side of a launch tower with a screw-driver trying to turn on your avionics before installing igniters! Sets the radio calibration back to the factory value. Does not go to 'pad' mode after five seconds. To get into 'emergency recovery' mode, first find the row of four small holes opposite the switch wiring. Using a short piece of small gauge wire, connect the outer two holes together, then power TeleMini up. Once the red LED is lit, disconnect the wire and the board should signal that it’s in 'idle' mode after the initial five second startup period. TeleMetrum and TeleMega include a complete GPS receiver. A complete explanation of how GPS works is beyond the scope of this manual, but the bottom line is that the GPS receiver needs to lock onto at least four satellites to obtain a solid 3 dimensional position fix and know what time it is. The flight computers provide backup power to the GPS chip any time a battery is connected. This allows the receiver to “warm start” on the launch rail much faster than if every power-on were a GPS “cold start”. In typical operations, powering up on the flight line in idle mode while performing final air-frame preparation will be sufficient to allow the GPS receiver to cold start and acquire lock. Then the board can be powered down during RSO review and installation on a launch rod or rail. When the board is turned back on, the GPS system should lock very quickly, typically long before igniter installation and return to the flight line are complete. One of the unique features of the Altus Metrum system is the ability to create a two way command link between TeleDongle and an altimeter using the digital radio transceivers built into each device. This allows you to interact with the altimeter from afar, as if it were directly connected to the computer. Any operation which can be performed with a flight computer can either be done with the device directly connected to the computer via the USB cable, or through the radio link. TeleMini doesn’t provide a USB connector and so it is always communicated with over radio. Select the appropriate TeleDongle device when the list of devices is presented and AltosUI will interact with an altimeter over the radio link. One oddity in the current interface is how AltosUI selects the frequency for radio communications. Instead of providing an interface to specifically configure the frequency, it uses whatever frequency was most recently selected for the target TeleDongle device in Monitor Flight mode. If you haven’t ever used that mode with the TeleDongle in question, select the Monitor Flight button from the top level UI, and pick the appropriate TeleDongle device. Once the flight monitoring window is open, select the desired frequency and then close it down again. All radio communications will now use that frequency. Save Flight Data—Recover flight data from the rocket without opening it up. Configure altimeter apogee delays, main deploy heights and additional pyro event conditions to respond to changing launch conditions. You can also 'reboot' the altimeter. Use this to remotely enable the flight computer by turning TeleMetrum or TeleMega on in “idle” mode, then once the air-frame is oriented for launch, you can reboot the altimeter and have it restart in pad mode without having to climb the scary ladder. Fire Igniters—Test your deployment charges without snaking wires out through holes in the air-frame. Simply assemble the rocket as if for flight with the apogee and main charges loaded, then remotely command the altimeter to fire the igniters. Operation over the radio link for configuring an altimeter, ground testing igniters, and so forth uses the same RF frequencies as flight telemetry. To configure the desired TeleDongle frequency, select the monitor flight tab, then use the frequency selector and close the window before performing other desired radio operations. The flight computers only enable radio commanding in 'idle' mode. TeleMetrum and TeleMega use the accelerometer to detect which orientation they start up in, so make sure you have the flight computer lying horizontally when you turn it on. Otherwise, it will start in 'pad' mode ready for flight, and will not be listening for command packets from TeleDongle. TeleMini listens for a command packet for five seconds after first being turned on, if it doesn’t hear anything, it enters 'pad' mode, ready for flight and will no longer listen for command packets. The easiest way to connect to TeleMini is to initiate the command and select the TeleDongle device. At this point, the TeleDongle will be attempting to communicate with the TeleMini. Now turn TeleMini on, and it should immediately start communicating with the TeleDongle and the desired operation can be performed. You can monitor the operation of the radio link by watching the lights on the devices. The red LED will flash each time a packet is transmitted, while the green LED will light up on TeleDongle when it is waiting to receive a packet from the altimeter. An important aspect of preparing a rocket using electronic deployment for flight is ground testing the recovery system. Thanks to the bi-directional radio link central to the Altus Metrum system, this can be accomplished in a TeleMega, TeleMetrum or TeleMini equipped rocket with less work than you may be accustomed to with other systems. It can even be fun! Just prep the rocket for flight, then power up the altimeter in “idle” mode (placing air-frame horizontal for TeleMetrum or TeleMega, or selecting the Configure Altimeter tab for TeleMini). This will cause the firmware to go into “idle” mode, in which the normal flight state machine is disabled and charges will not fire without manual command. You can now command the altimeter to fire the apogee or main charges from a safe distance using your computer and the Fire Igniter tab to complete ejection testing. TeleMetrum, TeleMini and TeleMega all incorporate an RF transceiver, but it’s not a full duplex system; each end can only be transmitting or receiving at any given moment. So we had to decide how to manage the link. By design, the altimeter firmware listens for the radio link when it’s in “idle mode”, which allows us to use the radio link to configure the rocket, do things like ejection tests, and extract data after a flight without having to crack open the air-frame. However, when the board is in “flight mode”, the altimeter only transmits and doesn’t listen at all. That’s because we want to put ultimate priority on event detection and getting telemetry out of the rocket through the radio in case the rocket crashes and we aren’t able to extract data later. We don’t generally use a 'normal packet radio' mode like APRS because they’re just too inefficient. The GFSK modulation we use is FSK with the base-band pulses passed through a Gaussian filter before they go into the modulator to limit the transmitted bandwidth. When combined with forward error correction and interleaving, this allows us to have a very robust 19.2 kilobit data link with only 10-40 milliwatts of transmit power, a whip antenna in the rocket, and a hand-held Yagi on the ground. We’ve had flights to above 21k feet AGL with great reception, and calculations suggest we should be good to well over 40k feet AGL with a 5-element yagi on the ground with our 10mW units and over 100k feet AGL with the 40mW devices. We hope to fly boards to higher altitudes over time, and would of course appreciate customer feedback on performance in higher altitude flights! TeleMetrum v2.0 and TeleMega can send APRS if desired, and the interval between APRS packets can be configured. As each APRS packet takes a full second to transmit, we recommend an interval of at least 5 seconds to avoid consuming too much battery power or radio channel bandwidth. You can configure the APRS interval using AltosUI; that process is described in Configure Altimeter. AltOS supports both compressed and uncompressed APRS position report data formats. The compressed format provides for higher position precision and shorter packets than the uncompressed APRS format. We’ve found some older APRS receivers that do not handle the compressed format. The Kenwood TH-72A requires the use of uncompressed format to display altitude information correctly. The Yaesu FT1D requires the use of compressed format to display altitude information. APRS packets include an SSID (Secondary Station Identifier) field that allows one operator to have multiple transmitters. AltOS allows you to set this to a single digit from 0 to 9, allowing you to fly multiple transmitters at the same time while keeping the identify of each one separate in the receiver. By default, the SSID is set to the last digit of the device serial number. The APRS packet format includes a comment field that can have arbitrary text in it. AltOS uses this to send status information as shown in the following table. Here’s an example of an APRS comment showing GPS lock with 6 satellites in view, a primary battery at 4.0V, and apogee and main igniters both at 3.7V from device 1286. Here’s an example of an APRS comment showing GPS lock with 6 satellites in view and a primary battery at 4.0V from device 1876. Make sure your primary battery is above 3.8V any connected igniters are above 3.5V and GPS is locked with at least 5 or 6 satellites in view before flying. If GPS is switching between L and U regularly, then it doesn’t have a good lock and you should wait until it becomes stable. If the GPS receiver loses lock, the APRS data transmitted will contain the last position for which GPS lock was available. You can tell that this has happened by noticing that the GPS status character switches from 'L' to 'U'. Before GPS has locked, APRS will transmit zero for latitude, longitude and altitude. TeleMega, TeleMetrum v2, EasyMega, EasyMini and TeleDongle v3 are all programmed directly over their USB connectors (self programming). TeleMetrum v1, TeleMini v1.0 and TeleDongle v0.2 are all programmed by using another device as a programmer (pair programming). It’s important to recognize which kind of devices you have before trying to reprogram them. Connect pin 6 and pin 1 of the companion connector. Pin 1 can be identified by the square pad around it, and then the pins could sequentially across the board. Be very careful to not short pin 8 to anything as that is connected directly to the battery. Pin 7 carries 3.3V and the board will crash if that is connected to pin 1, but shouldn’t damage the board. Connect pin 32 on the CPU to ground. Pin 32 is closest to the USB wires on the row of pins towards the center of the board. Ground is available on the capacitor next to it, on the end towards the USB wires. Connect pin 4 on the CPU to 3.3V, which can be done by connecting pin 1 to pin 4. Pin 1 is the left pin on the lower edge of the chip when the unit is oriented such that the SMA is at the top. Connect pin 30 on the CPU to ground. Pin 30 is the 6th pin from the right on the top when the unit is oriented such that the SMA is at the top. The big concept to understand is that you have to use a TeleMetrum v1.0, TeleBT v1.0 or TeleDongle v0.2 as a programmer to update a pair programmed device. Due to limited memory resources in the cc1111, we don’t support programming directly over USB for these devices. If you need to update the firmware on a TeleDongle v0.2, we recommend updating the altimeter first, before updating TeleDongle. However, note that TeleDongle rarely need to be updated. Any firmware version 1.0.1 or later will work, version 1.2.1 may have improved receiver performance slightly. Find the 'programming cable' that you got as part of the starter kit, that has a red 8-pin MicroMaTch connector on one end and a red 4-pin MicroMaTch connector on the other end. Take the 2 screws out of the TeleDongle v0.2 or TeleBT v1.0 case to get access to the circuit board. Plug the 8-pin end of the programming cable to the matching connector on the TeleDongle v0.2 or TeleBT v1.0, and the 4-pin end to the matching connector on the TeleMetrum. Note that each MicroMaTch connector has an alignment pin that goes through a hole in the PC board when you have the cable oriented correctly. Attach a battery to the TeleMetrum board. Plug the TeleDongle v0.2 or TeleBT v1.0 into your computer’s USB port, and power up the TeleMetrum. Pick the TeleDongle v0.2 or TeleBT v1.0 device from the list, identifying it as the programming device. Select the image you want put on the TeleMetrum, which should have a name in the form telemetrum-v1.2-1.0.0.ihx. It should be visible in the default directory, if not you may have to poke around your system to find it. Hit the 'OK' button and the software should proceed to flash the TeleMetrum with new firmware, showing a progress bar. Confirm that the TeleMetrum board seems to have updated OK, which you can do by plugging in to it over USB and using a terminal program to connect to the board and issue the 'v' command to check the version, etc. If something goes wrong, give it another try. You’ll need a special 'programming cable' to reprogram the TeleMini v1.0. You can make your own using an 8-pin MicroMaTch connector on one end and a set of four pins on the other. Plug the 8-pin end of the programming cable to the matching connector on the TeleDongle v0.2 or TeleBT v1.0, and the 4-pins into the holes in the TeleMini v1.0 circuit board. Note that the MicroMaTch connector has an alignment pin that goes through a hole in the PC board when you have the cable oriented correctly, and that pin 1 on the TeleMini v1.0 board is marked with a square pad while the other pins have round pads. Attach a battery to the TeleMini v1.0 board. Select the image you want put on the TeleMini v1.0, which should have a name in the form telemini-v1.0-1.0.0.ihx. It should be visible in the default directory, if not you may have to poke around your system to find it. Hit the 'OK' button and the software should proceed to flash the TeleMini v1.0 with new firmware, showing a progress bar. Confirm that the TeleMini v1.0 board seems to have updated OK, which you can do by configuring it over the radio link through the TeleDongle, or letting it come up in “flight” mode and listening for telemetry. Updating TeleDongle v0.2 firmware is just like updating TeleMetrum v1.x or TeleMini v1.0 firmware, but you use either a TeleMetrum v1.x, TeleDongle v0.2 or TeleBT v1.0 as the programmer. Find the USB cable that you got as part of the starter kit, and plug the “mini” end in to the mating connector on TeleMetrum v1.x, TeleDongle v0.2 or TeleBT v1.0. Plug the 8-pin end of the programming cable to the matching connector on the programmer, and the 4-pin end to the matching connector on the TeleDongle v0.2. Note that each MicroMaTch connector has an alignment pin that goes through a hole in the PC board when you have the cable oriented correctly. Attach a battery to the TeleMetrum v1.x board if you’re using one. Plug both the programmer and the TeleDongle into your computer’s USB ports, and power up the programmer. Pick the programmer device from the list, identifying it as the programming device. Select the image you want put on the TeleDongle v0.2, which should have a name in the form teledongle-v0.2-1.0.0.ihx. It should be visible in the default directory, if not you may have to poke around your system to find it. Make sure the configuration parameters are reasonable looking. If the serial number and/or RF configuration values aren’t right, you’ll need to change them. The TeleDongle v0.2 serial number is on the “bottom” of the circuit board, and can usually be read through the translucent blue plastic case without needing to remove the board from the case. Hit the 'OK' button and the software should proceed to flash the TeleDongle v0.2 with new firmware, showing a progress bar. Confirm that the TeleDongle v0.2 board seems to have updated OK, which you can do by plugging in to it over USB and using a terminal program to connect to the board and issue the 'v' command to check the version, etc. Once you’re happy, remove the programming cable and put the cover back on the TeleDongle v0.2. Be careful removing the programming cable from the locking 8-pin connector on TeleMetrum. You’ll need a fingernail or perhaps a thin screwdriver or knife blade to gently pry the locking ears out slightly to extract the connector. We used a locking connector on TeleMetrum to help ensure that the cabling to companion boards used in a rocket don’t ever come loose accidentally in flight. Each flight computer logs data at 100 samples per second during ascent and 10 samples per second during descent, except for TeleMini v1.0, which records ascent at 10 samples per second and descent at 1 sample per second. Data are logged to an on-board flash memory part, which can be partitioned into several equal-sized blocks, one for each flight. Configuration data is also stored in the flash memory on TeleMetrum v1.x, TeleMini v3.0 and EasyMini. This consumes 64kB of flash space. This configuration space is not available for storing flight log data. TeleMetrum v2.0, TeleMega and EasyMega store configuration data in a bit of eeprom available within the processor chip, leaving that space available in flash for more flight data. To compute the amount of space needed for a single flight, you can multiply the expected ascent time (in seconds) by 100 times bytes-per-sample, multiply the expected descent time (in seconds) by 10 times the bytes per sample and add the two together. That will slightly under-estimate the storage (in bytes) needed for the flight. For instance, a TeleMetrum v2.0 flight spending 20 seconds in ascent and 150 seconds in descent will take about (20 * 1600) + (150 * 160) = 56000 bytes of storage. You could store dozens of these flights in the on-board flash. The default size allows for several flights on each flight computer, except for TeleMini v1.0, which only holds data for a single flight. You can adjust the size. Version 1.6.1 includes support for our updated TeleBT v3.0 product and bug fixes in in the flight software for all our boards and ground station interfaces. Add support for TeleBT v3.0 boards. Add support for uncompressed APRS data, providing support for older APRS receivers. Uncompressed APRS data is less precise, takes more bandwidth and doesn’t have integrated altitude data. Make TeleDongle and TeleBT more tolerant of data rate variations from transmitting devices. Add map to Monitor Idle display. It’s nice to be able to verify that maps are working, instead of needing to use Monitor Flight. Fix frequency configuration to round values instead of truncate them, avoiding a common 1kHz error in the setting. Turn the Windows stub into a more useful program that can launch the application with parameters so that file manager icons work more reliably. Force KML export to use a C locale so that numbers are formatted with '.' instead of ',' for a decimal separator in non-US locales. Preload map tiles based on distance rather than number of tiles; this means you get the same resolution covering the entire area, rather than having high resolution near the center and low resolution further away. Allow configuration of frequency and callsign in Monitor Idle mode. Fix layout weirdness when resizing windows on Windows. Windows shouldn’t have giant blank spaces around the useful content anymore. Use a longer filter for descent speed values. This should provide something more useful on the display, although it will take longer to respond to changes now. Make Replay Flight run in realtime again. It had been set to run at 10x speed by mistake. Add offline map support using mapping code from AltosUI. Support TeleDongle (and TeleBT via USB) on devices supporting USB On-The-Go. Display additional TeleMega pyro channel status in Pad tab. Switch between metric and imperial units. Track multiple devices at the same time, selecting between them with a menu or using the map. Add hybrid, satellite and terrain map types. Use standard Android display conventions so that a menu button is available in the application title bar. Adjust layout to work on large and small screens; shrinking the go/no-go lights in smaller environments to try and make everything visible. Make voice announcements depend on current tab. Compute adjustment to current travel direction while in motion towards rocket. Version 1.6 includes support for our updated TeleDongle v3.0 product and bug fixes in in the flight software for all our boards and ground station interfaces. Add support for TeleDongle v3.0 boards. Don’t beep out the continuity twice by accident in idle mode. If the battery voltage report takes longer than the initialiation sequence, the igniter continuity would get reported twice. Record all 32 bits of gyro calibration data in TeleMega and EasyMega log files. This fixes computation of the gyro rates in AltosUI. Change TeleDongle LED usage. Green LED flashes when valid packet is received. Red LED flashes when invalid packet is received. Replace LPC11U14 SPI driver with non-interrupt version. The interrupt code would occasionally wedge on long transfers if interrupts were blocked for too long. This affects all released TeleGPS products; if you have a TeleGPS device, you’ll want to reflash the firmware. Compute tilt angle from TeleMega and EasyMega log files. This duplicates the quaternion-based angle tracking code from the flight firmware inside the ground station software so that post-flight analysis can include evaluation of the tilt angle. Shows the tool button window when starting with a data file specified. This means that opening a data file from the file manager will now bring up the main window to let you operate the whole application. Show the 'Connecting' dialog when using Monitor Idle. Lets you cancel the Monitor Idle startup when connecting over the radio link. Make 'Monitor Idle' work for TeleGPS devices when connected over USB. It’s nice for testing without needing to broadcast over the radio. Use different Windows API to discover USB devices. This works better on my Windows 7 box, and will be used if the older API fails to provide the necessary information. Look in more places in the registry to try and identify the installed Java version on Windows. If you install the default 32-bit version of Windows on a 64-bit OS, the Java registry information is hiding \SOFTWARE\Wow6432Node for some reason. Fix file association on Windows by searching for the javaw.exe program instead of assuming it is in %SYSTEMROOT%. This makes double-clicking on Altus Metrum data files in the file manager work correctly. When replaying a file, put 'done' in the Age field when we reach the end of the file, instead of continuing to count forever. In the Scan Channels code, wait for five seconds if we see any packet. This is needed because AltOS now sends the callsign, serial number and flight number only once every five seconds these days. In the Scan Channels code, reset pending flight state information each time we change channels. This avoids having flight computers appear on multiple frequencies by accident. Add support for EasyMega boards. 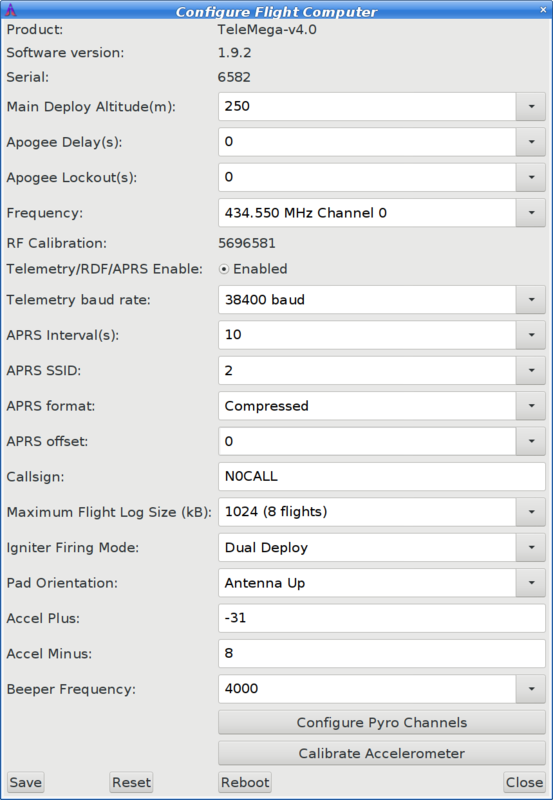 Make the APRS SSID be configurable. This lets you track different rockets on the same receiver without getting things mixed up. Report extra pyro channel continuity state on EasyMega and TeleMega via the beeper. This lets you easily verify flight readiness on these boards after powering up the electronics on the rail. Add lower telemetry data rates (2400 and 9600 bps) to increase telemetry radio range. This reduces the amount of data received as well as increasing battery consumption in the transmitter. Change TeleGPS to have only a single log, and append new data to it rather than using seperate per-flight logs. This avoids accidentally filling up log storage by turning TeleGPS on/off several times. Increase the maximum range for altitude values from +/-32767m to +/-2147483647m, allowing the flight computers to function correctly above the 32km level. Continuously test pyro firing conditions during delay stage, inhibiting the pyro channel if the test fails. This prevents firing pyro charges where the conditions were good before the delay, but become bad before the delay expires. Allow negative numbers in pyro configuration values. This lets you specify things like descending speed or deceleration. Support telemetry baud rate selection. Adds menus to the flight monitoring and configuration for baud rate selection. Integrate with file managers. This provides icons for all of our file types and associates our application with the files so that using a file manager to open a AltOS data file results in launching our application. Make the 'Graph' button on the landed tab work again. Make tests for Java on Windows a bit smarter, and also provide the user with the option to skip installing Java for cases where we just can’t figure out what version is installed. Checks for Java installation data in more registry locations. Allows user to bypass Java installation in case the detection fails. Version 1.4.1 is a minor release. It fixes install issues on Windows and provides the missing TeleMetrum V2.0 firmware. There aren’t any changes to the firmware or host applications at all. All Windows users will want to upgrade to get the signed driver, but Mac and Linux users who do not need the TeleMetrum V2.0 firmware image will not need to upgrade. Provide signed Windows driver files. This should avoid any need to disable driver signature checking on Windows 7 or 8. Fix Java version detection and download. Previously, the installer would only look for Java 6 or 7 and insist on downloading its own Java bits if there was something else installed. Furthermore, the 64-bit Java link provided didn’t work for anyone other than Keith, making it impossible to install AltOS on any machine with Java SE 8 installed. Include 1.4 firmware for TeleMetrum V2.0. None of the installers shipped this file. Now it’s included in the AltOS packages for Linux, Mac and Windows. Include Google Application Key for map downloading. The 1.4 release didn’t have this key in the released version of the software, making map downloading fail for most people. Add support for TeleGPS boards. Make the beeper tone configurable, making it possible to distinguish between two Altus Metrum products in the same ebay. Make the firing time for extra pyro channels configurable, allowing longer (or shorter) than the default 50ms. Only relevant for TeleMega at this time. Replace the 'dit dit dit' tones at startup with the current battery voltage, measured in tenths of a volt. This lets you check the battery voltage without needing telemetry, which is especially useful on EasyMini. Change state beeping to "Farnsworth spacing", which means they’re quite a bit faster than before, and so they take less time to send. Fix bug preventing the selection of the 'Flight State After' mode in pyro configuration. Fix bug where erasing flights would reset the flight number to 2 on TeleMega and TeleMetrum v2. Fix u-Blox GPS driver to mark course and speed data as being present. Add zooming and new content types (terrain and road maps) to map view. Change map storage format from PNG to Jpeg, which saves a huge amount of disk space. You will need to re-download all of your pre-loaded map images. Add a distance measuring device to the maps view. Select this by using any button other than the left one, or by pressing shift or control on the keyboard while using the left button. Add new 'Ignitor' tab to the flight monitor display for TeleMega’s extra ignitors. Add additional ignitor firing marks and voltages to the graph so you can see when the ignitors fired, along with the ignitor voltages. Add GPS course, ground speed and climb rate as optional graph elements. When flashing new firmware, re-try opening the device as sometimes it takes a while for the underlying operating system to recognize that the device has rebooted in preparation for the flashing operation. Hide Tilt Angle in ascent tab for devices that don’t have a gyro. Increase the width of data lines in the graphs to make them easier to read. Filter out speed and acceleration spikes caused by ejection charge firing when computing the maximum values. This provides a more accurate reading of those maximums. Fix EasyMini voltage displays. Early EasyMini prototypes used a 3.0V regulator, and AltosUI still used that value as the basis of the computation. 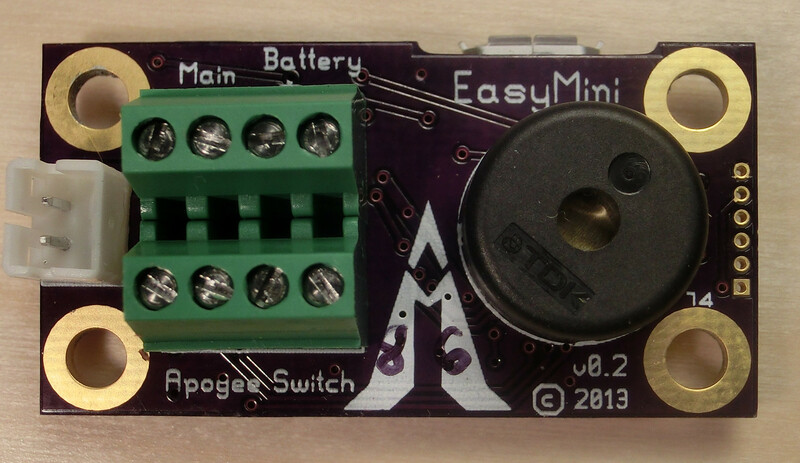 Production EasyMini boards have always shipped with a 3.3V regulator. Also, purple EasyMini boards sensed the battery voltage past the blocking diode, resulting in a drop of about 150mV from the true battery voltage. Compensate for that when displaying the value. Display error message when trying to configure maximum flight log size while the flight computer still has flight data stored. Handle TeleMetrum and TeleMini eeprom files generated with pre-1.0 firmware. Those ancient versions didn’t report the log format, so just use the product name instead. New application designed for use with TeleGPS boards. Shares code with AltosUI, mostly just trimmed down to focus on TeleGPS-related functions. Re-create the drill template images; they should print correctly from Firefox at least. Ship these as individual PDF files so they’re easy to print. Add a description of the 'Apogee Lockout' setting, which prevents the apogee charge from firing for a configurable amount of time after boost. On TeleMega, limit number of logged GPS status information to 12 satellites. That’s all there is room for in the log structure. Improve APRS behavior. Remembers last known GPS position and keeps sending that if we lose GPS lock. Marks locked/unlocked by sending L/U in the APRS comment field along with the number of sats in view and voltages. If the TeleMega flight firmware reports that it has logged information about more than 12 satellites, don’t believe it as the log only holds 12 satellite records. 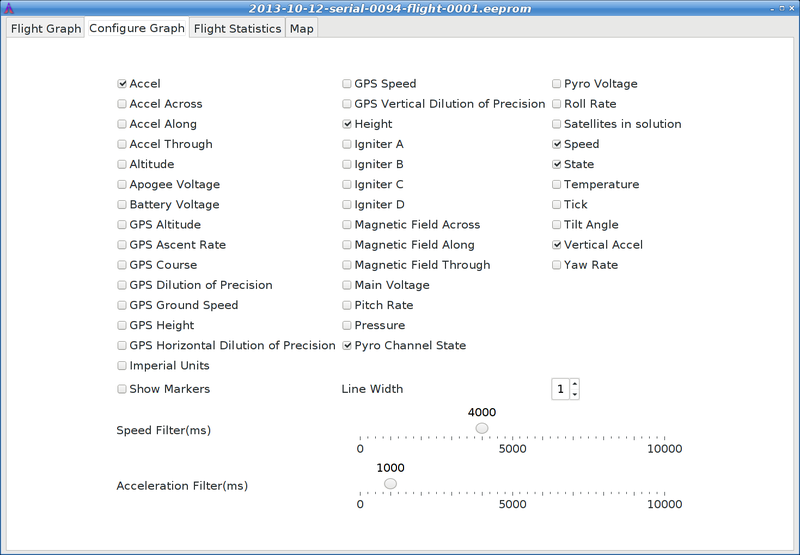 Track the maximum height as computed from GPS altitude data and report that in the flight summary data. 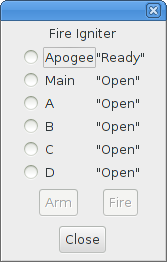 Use letters (A, B, C, D) for alternate pyro channel names instead of numbers (0, 1, 2, 3) in the Fire Igniter dialog. Version 1.3.1 is a minor release. It improves support for TeleMega, TeleMetrum v2.0, TeleMini v2.0 and EasyMini. Improved APRS mode. Now uses compressed position format for smaller data size, improved precision and to include altitude data as well as latitude and longitude. Also added battery and pyro voltage reports in the APRS comment field so you can confirm that the unit is ready for launch. Improve sensor boot code. If sensors fail to self-test, the device will still boot up and check for pad/idle modes. If in idle mode, the device will warn the user with a distinct beep, if in Pad mode, the unit will operate as best it can. Also, the Z-axis accelerometer now uses the factory calibration values instead of re-calibrating on the pad each time. This avoids accidental boost detect when moving the device around while in Pad mode. Fix antenna-down mode accelerometer configuration. Antenna down mode wasn’t working because the accelerometer calibration values were getting re-computed incorrectly in inverted mode. Display additional TeleMega sensor values in real units. Make all of these values available for plotting. Display TeleMega orientation value in the Ascent and Table tabs. Support additional TeleMega pyro channels in the Fire Igniter dialog. This lets you do remote testing of all of the channels, rather than just Apogee and Main. Limit data rate when downloading satellite images from Google to make sure we stay within their limits so that all of the map tiles download successfully. Version 1.3 is a major release. It adds support for TeleMega, TeleMetrum v2.0, TeleMini v2.0 and EasyMini. Add STM32L processor support. This includes enhancements to the scheduler to support products with many threads. Add NXP LPC11U14 processor support. Support additional pyro channels. These are configurable through the UI to handle air starts, staging, additional recovery events and external devices such as cameras. Add 3-axis gyro support for orientation tracking. This integrates the gyros to compute the angle from vertical during flight, allowing the additional pyro events to be controlled by this value. Support TeleMega, TeleMetrum v2.0, TeleMini v2.0 and EasyMini telemetry and log formats. Add 'Download' button to menu bar. Version 1.2.1 is a minor release. It adds support for TeleBT and the AltosDroid application, provides several new features in AltosUI and fixes some bugs in the AltOS firmware. 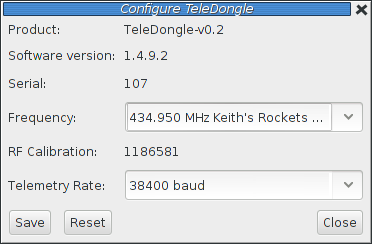 In TeleMini recovery mode (when booted with the outer two debug pins connected together), the radio parameters are also set back to defaults (434.550MHz, N0CALL, factory radio cal). Correct Kalman filter model error covariance matrix. The values used previously assumed continuous measurements instead of discrete measurements. Fix some bugs in the USB driver for TeleMetrum and TeleDongle that affected Windows users. Adjusted the automatic gain control parameters that affect receive performance for TeleDongle. Field tests indicate that this may improve receive performance somewhat. Make the initial position of the AltosUI top level window configurable. Along with this change, the other windows will pop up at 'sensible' places now, instead of on top of one another. Add GPS data and a map to the graph window. This lets you see a complete summary of the flight without needing to 'replay' the whole thing. Handle missing GPS lock in 'Descent' tab. 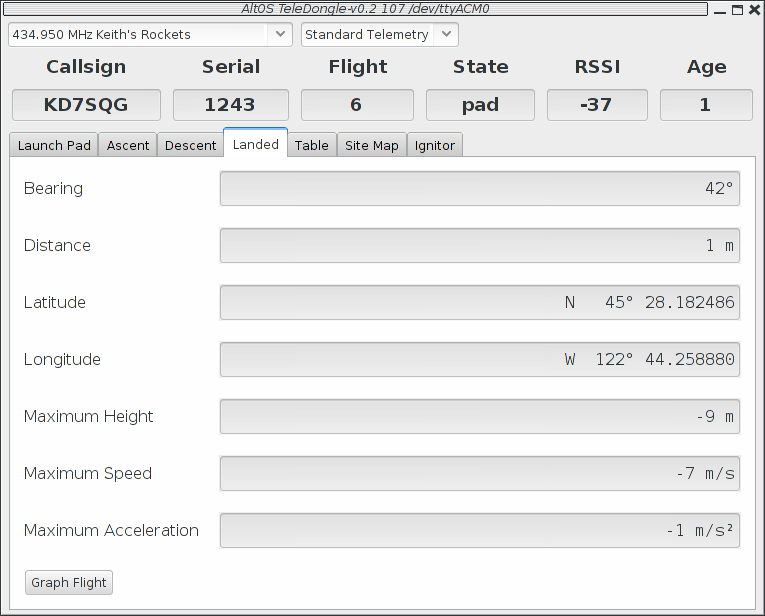 Previously, if the GPS position of the pad was unknown, an exception would be raised, breaking the Descent tab contents. Improve the graph, adding tool-tips to show values near the cursor and making the displayed set of values configurable, adding all of the flight data as options while leaving the default settings alone so that the graph starts by showing height, speed and acceleration. Add callsign to Monitor idle window and connecting dialogs. This makes it clear which callsign is being used so that the operator will be aware that it must match the flight computer value or no communication will work. When downloading flight data, display the block number so that the user has some sense of progress. Unfortunately, we don’t know how many blocks will need to be downloaded, but at least it isn’t just sitting there doing nothing for a long time. Version 1.2 is a major release. It adds support for MicroPeak and the MicroPeak USB adapter. Add MicroPeak support. This includes support for the ATtiny85 processor and adaptations to the core code to allow for devices too small to run the multi-tasking scheduler. Distribute Mac OS X packages in disk image ('.dmg') format to greatly simplify installation. Provide version numbers for the shared Java libraries to ensure that upgrades work properly, and to allow for multiple Altus Metrum software packages to be installed in the same directory at the same time. Version 1.1.1 is a bug-fix release. It fixes a couple of bugs in AltosUI and one firmware bug that affects TeleMetrum version 1.0 boards. Thanks to Bob Brown for help diagnosing the Google Earth file export issue, and for suggesting the addition of the Ground Distance value in the Descent tab. TeleMetrum v1.0 boards use the AT45DB081D flash memory part to store flight data, which is different from later TeleMetrum boards. The AltOS v1.1 driver for this chip couldn’t erase memory, leaving it impossible to delete flight data or update configuration values. This bug doesn’t affect newer TeleMetrum boards, and it doesn’t affect the safety of rockets flying version 1.1 firmware. The “Descent” tab displays the range to the rocket, which is a combination of the over-the-ground distance to the rockets current latitude/longitude and the height of the rocket. As such, it’s useful for knowing how far away the rocket is, but difficult to use when estimating where the rocket might eventually land. A new “Ground Distance” field has been added which displays the distance to a spot right underneath the rocket. Creating a Google Earth file (KML) from on-board flight data (EEPROM) would generate an empty file. The code responsible for reading the EEPROM file wasn’t ever setting the GPS valid bits, and so the KML export code thought there was no GPS data in the file. The “Landed” tab was displaying all values in metric units, even when AltosUI was configured to display imperial units. Somehow I just missed this tab when doing the units stuff. Sensor data wasn’t being displayed for TeleMini flight computers in Monitor Idle mode, including things like battery voltage. The code that picked which kinds of data to fetch from the flight computer was missing a check for TeleMini when deciding whether to fetch the analog sensor data. Version 1.1 is a minor release. It provides a few new features in AltosUI and the AltOS firmware and fixes bugs. Add apogee-lockout value. Overrides the apogee detection logic to prevent incorrect apogee charge firing. Force the radio frequency to 434.550MHz when the debug clock pin is connected to ground at boot time. This provides a way to talk to a TeleMini which is configured to some unknown frequency. Provide RSSI values for Monitor Idle mode. This makes it easy to check radio range without needing to go to flight mode. Fix a bug where the data reported in telemetry packets was from 320ms ago. Fix a bug which caused the old received telemetry packets to be retransmitted over the USB link when the radio was turned off and back on. Make the look-n-feel configurable, providing a choice from the available options. Add an 'Age' element to mark how long since a telemetry packet has been received. Useful to quickly gauge whether communications with the rocket are still active. Add 'Configure Ground Station' dialog to set the radio frequency used by a particular TeleDongle without having to go through the flight monitor UI. Add configuration for the new apogee-lockout value. A menu provides a list of reasonable values, or the value can be set by hand. Add Imperial units mode to present data in feet instead of meters. Fix a bug that caused GPS ready to happen too quickly. The software was using every telemetry packet to signal new GPS data, which caused GPS ready to be signalled after 10 packets instead of 10 GPS updates. Fix Google Earth data export to work with recent versions. The google earth file loading code got a lot pickier, requiring some minor white space changes in the export code. Changed how flight data are downloaded. Now there’s an initial dialog asking which flights to download, and after that finishes, a second dialog comes up asking which flights to delete. Re-compute time spent in each state for the flight graph; this figures out the actual boost and landing times instead of using the conservative values provide by the flight electronics. This improves the accuracy of the boost acceleration and main descent rate computations. Make AltosUI run on Mac OS Lion. The default Java heap space was dramatically reduced for this release causing much of the UI to fail randomly. This most often affected the satellite mapping download and displays. Change how data are displayed in the 'table' tab of the flight monitoring window. This eliminates entries duplicated from the header and adds both current altitude and pad altitude, which are useful in 'Monitor Idle' mode. Support operation of TeleMetrum with the antenna pointing aft. Previous firmware versions required the antenna to be pointing upwards, now there is a configuration option allowing the antenna to point aft, to aid installation in some airframes. Ability to disable telemetry. For airframes where an antenna just isn’t possible, or where radio transmissions might cause trouble with other electronics, there’s a configuration option to disable all telemetry. Note that the board will still enable the radio link in idle mode. Arbitrary frequency selection. The radios in Altus Metrum devices can be programmed to a wide range of frequencies, so instead of limiting devices to 10 pre-selected 'channels', the new firmware allows the user to choose any frequency in the 70cm band. Note that the RF matching circuit on the boards is tuned for around 435MHz, so frequencies far from that may reduce the available range. Change telemetry to be encoded in multiple 32-byte packets. This enables support for TeleMini and other devices without requiring further updates to the TeleDongle firmware. Kalman-filter based flight-tracking. The model based sensor fusion approach of a Kalman filter means that AltOS now computes apogee much more accurately than before, generally within a fraction of a second. In addition, this approach allows the baro-only TeleMini device to correctly identify Mach transitions, avoiding the error-prone selection of a Mach delay. Add main/apogee voltage graphs to the data plot. This provides a visual indication if the igniters fail before being fired. Scan for altimeter devices by watching the defined telemetry frequencies. This avoids the problem of remembering what frequency a device was configured to use, which is especially important with TeleMini which does not include a USB connection. Monitor altimeter state in "Idle" mode. This provides much of the information presented in the "Pad" dialog from the Monitor Flight command, monitoring the igniters, battery and GPS status withing requiring the flight computer to be armed and ready for flight. Pre-load map images from home. For those launch sites which don’t provide free Wi-Fi, this allows you to download the necessary satellite images given the location of the launch site. A list of known launch sites is maintained at altusmetrum.org which AltosUI downloads to populate a menu; if you’ve got a launch site not on that list, please send the name of it, latitude and longitude along with a link to the web site of the controlling club to the altusmetrum mailing list. Flight statistics are now displayed in the Graph data window. These include max height/speed/accel, average descent rates and a few other bits of information. The Graph Data window can now be reached from the 'Landed' tab in the Monitor Flight window so you can immediately see the results of a flight. Wait for altimeter when using packet mode. Instead of quicly timing out when trying to initialize a packet mode configuration connection, AltosUI now waits indefinitely for the remote device to appear, providing a cancel button should the user get bored. This is necessary as the TeleMini can only be placed in "Idle" mode if AltosUI is polling it. Version 0.9.2 is an AltosUI bug-fix release, with no firmware changes. Fix plotting problems due to missing file in the Mac OS install image. Always read whole eeprom blocks, mark empty records invalid, display parsing errors to user. Version 0.9 adds a few new firmware features and accompanying AltosUI changes, along with new hardware support. Support for TeleMetrum v1.1 hardware. Sources for the flash memory part used in v1.0 dried up, so v1.1 uses a different part which required a new driver and support for explicit flight log erasing. Multiple flight log support. This stores more than one flight log in the on-board flash memory. It also requires the user to explicitly erase flights so that you won’t lose flight logs just because you fly the same board twice in one day. Telemetry support for devices with serial number >= 256. Previous versions used a telemetry packet format that provided only 8 bits for the device serial number. This change requires that both ends of the telemetry link be running the 0.9 firmware or they will not communicate. Support for telemetry format changes. Support for multiple flight logs. Version 0.8 offers a major upgrade in the AltosUI interface. Post-flight graphing tool. 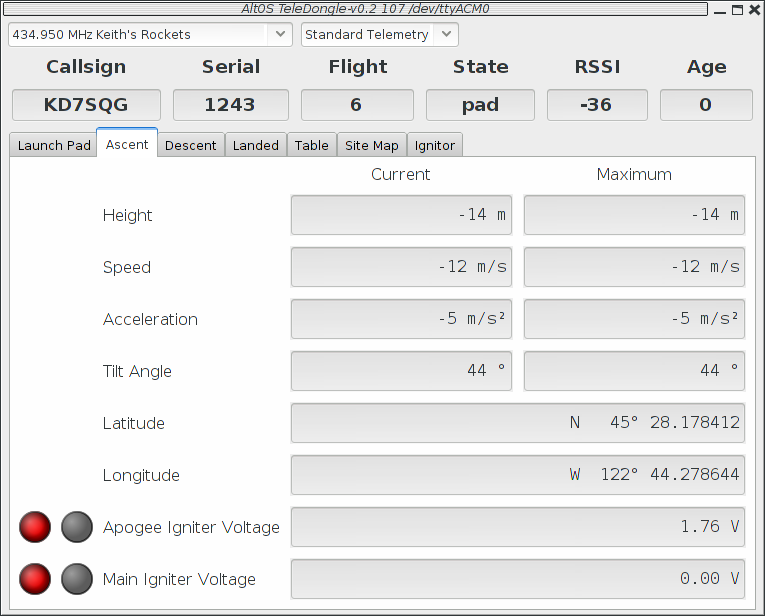 This lets you explore the behaviour of your rocket after flight with a scroll-able and zoom-able chart showing the altitude, speed and acceleration of the airframe along with events recorded by the flight computer. You can export graphs to PNG files, or print them directly. Real-time moving map which overlays the in-progress flight on satellite imagery fetched from Google Maps. 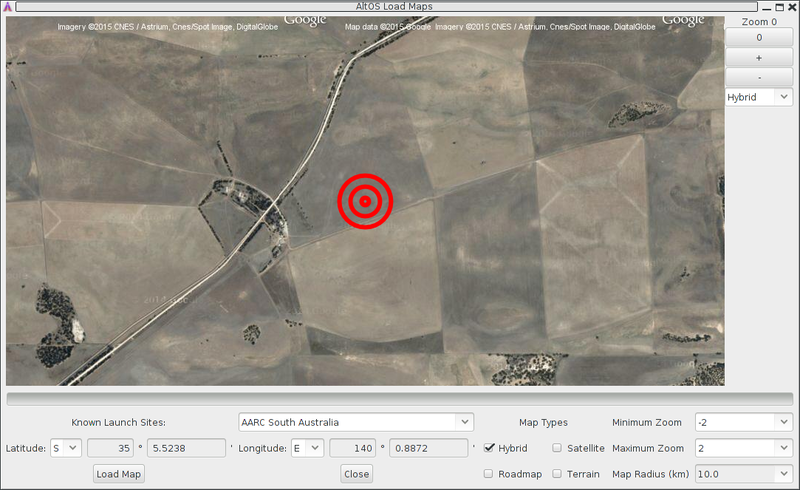 This lets you see in pictures where your rocket has landed, allowing you to plan recovery activities more accurately. Wireless recovery system testing. Prep your rocket for flight and test fire the deployment charges to make sure things work as expected. All without threading wires through holes in your airframe. Optimized flight status displays. Each flight state now has it’s own custom 'tab' in the flight monitoring window so you can focus on the most important details. Pre-flight, the system shows a set of red/green status indicators for battery voltage, apogee/main igniter continutity and GPS reception. Wait until they’re all green and your rocket is ready for flight. There are also tabs for ascent, descent and landing along with the original tabular view of the data. Monitor multiple flights simultaneously. If you have more than one TeleDongle, you can monitor a flight with each one on the same computer. Automatic flight monitoring at startup. Plug TeleDongle into the machine before starting AltosUI and it will automatically connect to it and prepare to monitor a flight. Exports Google Earth flight tracks. Using the Keyhole Markup Language (.kml) file format, this provides a 3D view of your rocket flight through the Google Earth program. Version 0.7.1 is the first release containing our new cross-platform Java-based user interface. Receive and log telemetry from a connected TeleDongle device. All data received is saved to log files named with the current date and the connected rocket serial and flight numbers. There is no mode in which telemetry data will not be saved. Download logged data from TeleMetrum devices, either through a direct USB connection or over the air through a TeleDongle device. 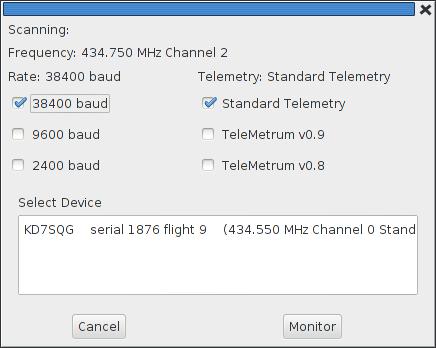 Configure a TeleMetrum device, setting the radio channel, callsign, apogee delay and main deploy height. This can be done through either a USB connection or over a radio link via a TeleDongle device. Replay a flight in real-time. This takes a saved telemetry log or eeprom download and replays it through the user interface so you can relive your favorite rocket flights. Reprogram Altus Metrum devices. Using an Altus Metrum device connected via USB, another Altus Metrum device can be reprogrammed using the supplied programming cable between the two devices. Export Flight data to a comma-separated-values file. This takes either telemetry or on-board flight data and generates data suitable for use in external applications. All data is exported using standard units so that no device-specific knowledge is needed to handle the data. Speak to you during the flight. Instead of spending the flight hunched over your laptop looking at the screen, enjoy the view while the computer tells you what’s going on up there. During ascent, you hear the current flight state and altitude information. During descent, you get azimuth, elevation and range information to try and help you find your rocket in the air. Once on the ground, the direction and distance are reported.